Curling your hair is something that can truly change the way you look for the better. But if you don’t plan to go to a professional hairstylist to achieve this new image, you will definitely need high quality tools in order to do it at home. Curling irons are created especially for this purpose and if you choose the right one, you will definitely have the results you want in a matter of minutes. Here’s everything you need to know when it comes to the best curling iron for short hair! Choosing a curling iron can be a long time investment if you decide on the right product for your needs. Keep in mind that a curling iron for short hair should also be easy to work with in case you decide to let your hair grow more. 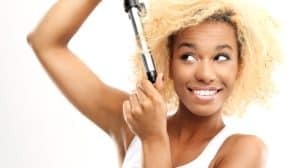 And if you are not sure what aspects to focus on before you pull your credit card out, here are the main tips to end up with the best curling iron for your type of hair! The best curling irons are made of ceramic which allows them to resist to the levels of heat that they can reach. You can check the material that your curling iron is made of, in the description of the product. Nowadays, most of those products are made of ceramic but you can still find ones made of certain types of metal which is why you need to pay attention to such a detail. The main feature that creates those curls and waves is the temperature that such a curling iron can reach. Most of them will go up to 430 degrees F or 450 degrees F. however, it is also important to choose a product that comes with temperature control. This will allow you to choose exactly what temperature you want for the type of hairstyle that you want. Some curling irons come with a glove that will protect you against heat so you won’t burn yourself. This glove is made from a special material and it is included in the price of the package. Also, you may get a curling iron that comes with a shut off function which allows you to stop worrying about turning your iron off when you are done. The size of the curling iron is very important. This will determine the size of your curls and the way it can be used on short hair. Generally, you can use a thin curling iron if you have short hair as this will be more efficient. Most irons come with a diameter of 1 inch or 1.5 inch and what you choose is definitely based on your preferences. The market has plenty of curling irons to choose from, some intended for special curls or different hair lengths. While this is great because it offers you more options when you want to style your hair, it can also become confusing and overwhelming. So, if you don’t want to waste hours looking for the best products online, here’s a list that will ease your job significantly. Regardless to the curling iron that you may choose from the following ones, you can count on the fact that all of them are of a high quality and they enjoy positive reviews to rely on. This product is one of the best that you can choose when you want to give some romantic curls to your hair. It is made of a bio ceramic heater that will define your waves and curls and keep them lasting for a long time. Made with the latest technology in the matter, this is a product that will last you a long time. Your curls and waves will have an amazing texture and shine for the entire day. By using this curling iron you can be sure that you will not end up with frizzy curls. As a matter of fact, your hair will look as healthy and natural as possible. This iron doesn’t come only at a high quality but also with a very modern and compact design. You can use it at home or take with you when you travel for the same result. T3 is another model of curling iron that comes with plenty of advantages for the user. You get not less than three wand barrels that you can change as you please in order to get the best hairstyle. You will be able to create romantic waves and even more complicated hairstyles in a matter of minutes from the comfort of your home. Your hair will not be damaged as you use this product even if you create the curls you like on a regular basis. Each barrel wand and heat settings is suitable for a particular type of hairstyle which is why you should pay attention to what you want to create by using this product. And get ready to discover that everything is possible because you will be able to change your look as often as you please. If you are a fan of loose, romantic curls, this curling iron is for you. Now, you can create those beach waves every time you want without going to a professional hairstylist by simply using this Neuro Unclipped styling rod curling iron. This can be used on both long and short hair thanks to the Clipless premium IsoTherm titanium barrel. The temperature is adjustable as well so you can cover a wide variety of curls and hairstyles. And don’t be concerned about this iron damaging your hair because it is completely safe as long as you use it correctly and follow the safety measures. The extra long barrel makes it very easy to use and allows you plenty of flexibility as well. This curling iron might save you a lot of time and money if you trust it enough to invest in it. You can adjust the heat for up to 450 degrees F according to the texture of your hair and the style that you are going for. Made of ceramic, the barrel will last for a long time and it is very resistant to heat. After you are done using it, you will be glad to notice that your hair has a smooth and shiny look. This product comes with a special glove so you will not risk to burn yourself while using it. It can work just fine for long and short hair but if you are looking for the perfect curls, you should try your best to adjust the way you hold it according to the length of your hair. And the price that this one comes at tends o be one of the best on the market which is why you should definitely consider it. LumaBella offers a great curling iron for all types of hair as it is safe to use and it offers incredible results. You have complete control to get the curls that you want in the shortest time. 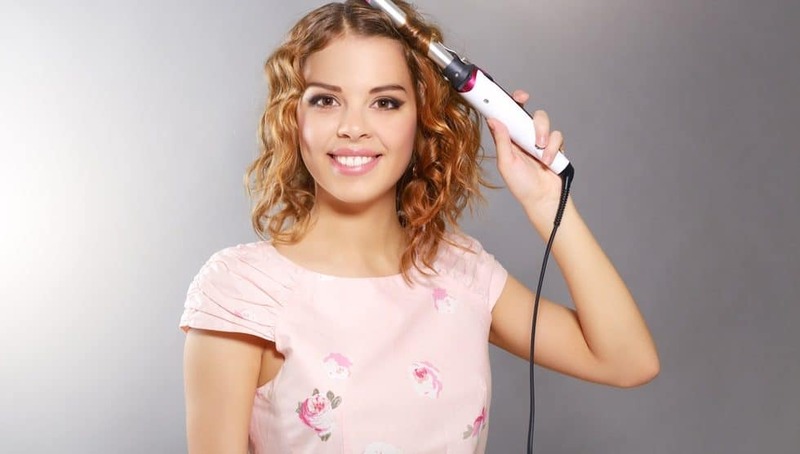 Even if you want to create a complex hairstyle, you will have no problems doing so by using this curling iron. It comes with a travel pouch so you can take it with you everywhere you want. Also, it comes with an international voltage so you can use it in a variety of countries. This is the perfect curling iron for short hair but it works just as fine for middle length and long hair. The design of this iron is a very modern one as well and it will be a pleasure to use it. NuMe is one of those classic curling wands that will ease your life a lot and allow you to enjoy the hairstyle of your dreams. The 18 mm barrel is perfect for tight ringlets and the heat can be adjusted to your needs. Thanks to the friction free function, this curling iron will not expose your hair to damage or frizz and you can count on it for any type of hairstyle. The moisture is eliminated by the negative ion conditioning technology. And the 100 percent tourmaline ceramic barrel is perfect for crease free curls. Considering the price that this product comes at, you can consider it to be a long term investment as you will be able to enjoy it for a long time. This is a product made to last and it is highly resistant. This curling iron is the best selling product on on the British market but not only there as it became popular world wide. It is easy to use for both adults and children as long as they are supervised. It is recommended to apply a protective layer on your hair to make sure that it will not get burned because this iron can get quite hot in a matter of seconds. The results that you will achieve will be similar to those that you would get if you have a professional hairstylist taking care of your hair. The curls will last up to 24 hours which is an incredible result. And the manufacturer offers an impressive warranty that assures the clients of the high quality of this product. This curling iron is perfect even for thick and straight hair which is why you can use it for the most complex hairstyles. If you are looking for a curling iron that suits all types of hair, this is the right product for you. It is also one that comes at a very good price which makes it a great investment. Thanks to the 7.1 inch ceramic barrel and the 1.3 inch long curling iron makes it perfect for all lengths of hair and it is going to leave your hair smooth and healthy, without exposing it any any risks. It comes with a ionic anti-static and the heating feature of this iron is safe for your hair, regardless to the type of style you are going for. You can adjust the heat anywhere between 265 degrees F and 450 degrees F which makes it perfect for fine, thick and normal hair equally. You can get it with a 1 inch barrel or a 1.5 inch barrel according to your preferences. Olaxer is one of the best curling irons that you can find on the market. The same brand offers a curling wand and a straightening wand if you want to be ready to create all the hairstyles you want. You can choose between 5 different heat settings according to the type of curls you want and the texture of your hair. This device will not expose you or your hair to any risks when you are using it, as long as you follow the instructions that it comes with. This product is certified FCC and it comes with international voltage so you can use it in any country, which makes it perfect for travelling. In 60 seconds, this curling iron can reach a heat level of 430 degrees F. The curls you will obtain will be frizz free and look very healthy and smooth. And last but not least, this Remington Tstudio Thermaluxe pro is a very efficient curling iron that you can safely use in the comfort of your house. Te heat temperature of this curling iron remains constant which allows you to create the waves and curls you want without being worried about burning your hair. Your curls will last around 24 hours and in some cases even more than that. The final result also depends on the texture of your hair as well as the type of hair you have. This is an ideal product for short hair as you will be able to hold it easily and use it in all ares of your head without any problems. The heat level that you want will be reached in not more than 30 seconds after you plug it in. And to make it even better, this item comes with a 4 years limited warranty which makes it even more reliable. The main risk that you expose your hair to when you use a curling iron, is the extreme heat. This is even more dangerous is you use your iron on a daily basis. And once you see the benefits and the beauty of your new curls, it will be hard to not use it daily. But here’s how you can protect your hair and take care of its natural shine while using a curling iron regularly. Make sure to wash your hair and dry it completely before using the curling iron under heat. This will protect your hair a lot more than if you would use such an iron on wet hair. If you apply your iron on wet hair you will boil all the moisture off it and you will damage it a lot in a very short time. Also, try to dry it with a towel or a cold hair drier because if you use a hot air to dry it and then you use the heat from the iron you will expose it to double heat. Nowadays, the market comes with a variety of heat protectors that you can use before starting to create those fabulous curl with your curling iron. You can use a spray or a cream can be applied on your hair minutes before you use a curling iron. Also, there are conditioners that add a protection layer on your hair against such extreme heat. Each section of hair should be used for a short and limited period of time. 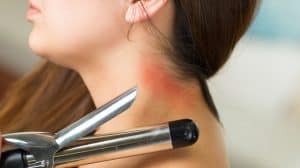 Don’t keep the curling iron for more than a few seconds on each section because you risk burning it. Also, check the instructions that come with the curling iron and respect them each time you style your hair. If you do feel like your curls should be more defined, you can always get back to a certain section and reuse the curling iron on it for the recommended time. This is a lot safer than keeping it on your hair for a longer period of time. And you will obtain better results as well! When you are done with the curling process, you should consider using a moisturiser that will reestablish the level of hydration and moisture that your hair needs. This will keep your hair healthy and shiny for a long time. You can use a moisturiser that comes in the form of a spray or simply use a hair mast once or twice a week to make sure that you provide all the nutrients it needs. These gloves are meant to protect your hands more than your hair which is also an aspect that you shouldn’t neglect. Most irons will come with such a glove included as we mentioned above and you are supposed to wear it on the hand that is not holding the iron during curling process. However, if your iron doesn’t come with such a glove, you can get one separately. It can be a real life saver and protect you against accidents and burns! These gloves don’t protect your hand entirely but they delay the burning so you might avoid the heat a little longer by wearing them when you twist your hair on the iron. You might be curios and lack patience to see the final effect of your curling process but it is a great idea for you and your hair to take some breaks as you are curling it. Don’t curl one section of hair over and over again without giving it some minutes to breathe and get some fresh air because you will only destroy your hair and make your edges split. As you can see, it is fairly easy to create the curls and waves that you want as long as you are aware of certain details. Using the right curling iron is crucial in order to obtain the final result. And by choosing one of the curling irons presented above, you can’t make a mistake because they are the best on the market and the most popular ones. However, the technique you have is also very important. You can use a curling iron on a daily basis without damaging your hair at all, as long as you do all you can to protect it against potential side effects. Exposure to extreme heat can indeed be detrimental for the health of your hair but if you use a protective product, you shouldn’t have to worry about it at all. Follow this complete guide and enjoy the curls you always wanted to have without investing money in professional hairstyling services! Remember that in time, you will master all the techniques to create those fancy curls so don’t panic if you can’t do it from your first attempt.